A rugby player’s body is a bony, muscle movement machine. Used for the simple tasks of making new humans, finding food for the village, and to have the biomechanical capability to kill and, now dead, drag that inferior muscle movement machine back to the tribe for a feast. We still have these characteristics. We like to consider ourselves to have evolved into these sophisticated, house dwelling, online shopping, manners having, flavored vaping, self-entitled top of the world’s tallest food chain-ers. But, if a pissed off grizzly bear burst through the door to whatever room you are in right now, your eyes would dilate while simultaneously losing peripheral vision to focus on the one-ton killing machine looking at you in your pale face. Confronted with a bear, or any heart-pounding situation, dilation would occur in all of the blood vessels in your extremities. This dilation happens in conjunction with an increased heart rate – up to the frequency of a helicopter rotor-blade keeping rhythm at a heavy metal concert – as your body floods every muscle it can with the nutrients required. In this state, your body is priming you for one of two actions; either start using pens and keyboards as knives or turn tail and make an exit as fast as possible. The overall muscle tension of your body would go from “cold grilled cheese sandwich” to a baseball wrapped in barbed wire set in a slingshot stretched to its structural limits. You’d even start producing more clotting agents to keep blood loss to a minimum to prepare for the mauling. Does your heart rate go up a little just reading this? Good. This physical reaction is left-over caveman stuff that has kept humans alive over the centuries. The fight or flight response to intense situations is regulated by your sympathetic nervous system. Every time you walk onto the rugby field, every time you pack down for a scrum, and every time you impose your sheer physical will over someone else through some act of chaotically controlled violence, you trigger this response. Being able to understand this mechanism may help you implement you to improve your performance on the rugby field. Priming is a process whereby an athlete will attempt to elicit a positive neural response from their body before athletic competition. The idea is to use a physical stimulus to “prime” or “charge” a the muscles in preparation for a competitive movement. Matching the priming movement and intensity with the correct rest interval can lead to a positive increase in performance for similar physical tasks. The concept of neural priming (post activation potential, or PAP) for sports performance has two leading physiological explanations. If you’re like me, the science behind PAP is super-interesting. But if you trust us that it works, you can skip ahead to find out how to use priming to improve your on-field rugby performance. For the rest of you, though, let’s do a quick primer on the neuromuscular physiology involved in PAP. The first proposed explanation of PAP goes along with my Neanderthal-mode signaling grizzly bear introduction. An initial intense bout of exercise may prep the spinal cord to have an increased resting action potential. In other words, the spine and cascading nervous system can become loaded to generate force than they would without a PAP stimulus. This loading increases something called the “postsynaptic potential.” Our synapses are the areas where an impulse signaling movement leaves a nerve and moves to the surface of our muscles. The PAP response may create an environment where nerve impulses signaling movement in our bodies move at a much faster rate, thus allowing us to increase the speed at which we generate muscular force. Significant S&C research has shown that a proper PAP protocol can help athletes more readily “switch on” a fight or flight response when it comes time for performance testing or sport. The second theory is that sufficient intensity of the PAP exercise will improve an athlete’s muscular sensitivity to calcium. Calcium is released once the impulse mentioned above reaches the muscle through the synapse and gives our muscles the green light to start contracting. A higher sensitivity to calcium in the structures responsible for cross-bridging and contracting may put may allow our muscles to produce a higher force contraction than they would otherwise. Since there are several synergistic mechanisms at play in both theories, I believe the PAP effect should be treated as a combination of each explanation. Unless you are taking into consideration the external variables, like joint angles involved in the sporting task you are trying to improve upon, these conditions might not really be helpful. The most widely researched exercise used to determine if PAP is a viable sports-enhancement technique is the half/full barbell back squat. Chiu et al. found an increase in jump squat power after having participants perform 90% of their one rep half squat max for 5 sets of 1 rep.
Total power output improved for 30, 50, and 70% of the participants’ jump squat max. Similarly, Kilduff et al. used a 3 rep max back squat and found a significant 6.8% improvement in vertical jump with counter movement (with a barbell on the subjects back to take out any momentum from arm swing). McBride et al. has also found that 3 reps at 90% of a half squat max can attribute to positive increases in short distance sprint times in football. If you’ve tried our power-focused rugby leg workout you may have noticed some of these effects first-hand. To sum it up, the PAP exercise must be similar in joint angle and force production as the marker of performance that is being desired to be improved. Half squats are chosen more widely over full squats because the shorter distance closely mimics a jump with counter movement and the start of/acceleration phase of a short distance sprint. So if your rugby club is doing a vertical jump test as part of their combine, you may well be better off priming with a half-squat than with a full-squat. The next logical question is, “well, why wouldn’t I just use some other kind of jump or run to “prime” my tested jump or run?” Esformes et al. had the same idea and tested the PAP of 3 rep max half back squats versus plyometric exercises consisting of 6 contacts each of alternate speed bounds, right leg speed hops, left leg speed hops, and vertical bounds for a total of 24 contacts with 15 seconds of rest between each modality. His team found that the 3 rep max followed by 5 minutes of rest was superior in eliciting PAP in the performance of a vertical jump with countermovement. This is one of the clearest differentiators of the PAP effects created by heavy squats versus plyometrics. A major issue here that may have been overlooked is that the plyometric protocol took an average of 70 seconds to complete. Even an elite-level athlete is going to accumulate fatigue from over a minute of intense, maximal effort bounding and hopping. As a reference, the squat exercise only took an average of 15 seconds per set. Esformes et al. also suggests that contractions held over 10 seconds might dissipate PAP effect. If future research is done in this area, either fewer contacts or more rest should be used in order to help disperse the fatigue response in plyometric priming. Speaking of optimal rest interval, Blair et al. wondered if PAP response changed over time. He utilized a 3 rep max half squat with 9 male rugby players that were at least capable of a 1.5x bodyweight squat, and PAP tests at 15 seconds, 4, 8, 12, and 16 minutes post experimental intervention. Interestingly, the performance tests performed were a vertical jump with counter-movement, a 100kg (220lb) sled push on a 3 degree grade incline, 5 meter, and 10 meter sprints. As expected, post-testing at 15 seconds for all assessments resulted in an average decline of nearly 5% from baseline tests. There was also a 2-3% decrease at the 16 minute retest mark for jumps with a countermovement. Improvements averaged 3.65% for the 4 and 8 minute retest mark. One subject showed an increase of 5.7% at the 4 minute mark. So, if you haven’t gone blind from all those numbers or punched a hole through your monitor out of sheer frustration, let’s sum it up – 15 seconds is too short a period of time and 16 minutes is too long a period of time to elicit a PAP response. Another thing to note here, there was no significant increase in performance (even though there were slight positive increases, just not significant) at those 4 and 8 minute retest times for any of the other tests (sled push, 5m, and 10m sprint times). As previously mentioned, this is most likely due to the squat exercise not being joint angle specific to these modalities. Some training and dietary influences will impact athletes differently depending on things like their Vo2 Max and resting heart rate. For example, nitrate supplements and no2 boosters are known to have a greater % benefit the lower your Vo2 Max. Meaning that they’re more effective for amateur rugby players than they are for professionals. Another variable to keep in mind regarding PAP is that effects are more pronounced in intermediate to advanced level athletes. Fiber type distribution and strength-power ratio also play key roles in derived improvement from PAP. The belief for this is the longer duration of training experience for short burst intense exercise increases the type II (fast twitch) fiber cross-sectional area. Thus, “Strength training may also increase the probability of PAP occurring by developing the type II fibers and allowing more high-threshold motor units to be recruited” (Crewther et al., 2011). The stronger and more experienced an individual is the higher the response to PAP inducing modalities. Thus, PAP is a viable short-term and repeatable performance enhancer in assessments when joint angle and motor patterns are similar with both the action that wants to be improved and the intervention exercise. So far, droves of research suggest exercise intensities from 85-90+ percent are more efficient than lower intensities and plyometrics (even though there are still small increases in performance with plyos). Also, fatigue accumulation needs to be taken into account. Single sets of 1, 3, and 5 rep maxes seemed to be enough to cause a positive performance increase while not accumulating enough fatigue to degrade post testing scores. To quote DeRenne: “Optimal performance occurs when fatigue has subsided and PAP effect still exists.” That sweet spot seems to be in between 8 and 12 minutes (Kilduff et al., 2007). Finally, a higher training age and more sport experience seems to yield a much higher response to PAP because of long-term adaptations from heavy training. Now that all of that crap is out of the way, how do we actually implement these techniques to increase the performance on the rugby field? Luckily, Laurent B. Seitz, MSc and Gregory Haff, PhD, CSCS*D, FNSCA are way smarter than all of us. They pretty much reviewed every piece of literature available (and then some) to throw together these targeted rugby-specific “strength-power potentiating complexes” (SPPC) geared towards optimizing situation-based performance. (All charts pulled from Seitz and Haff, 2015). Personally, I would err on the side of being a little more conservative with the sets suggested. Just to make sure fatigue didn’t become a factor. The above program suggestions seem to be geared more towards high intermediate to advanced level athletes. Especially in regards to the suggested competition-specific tasks (i.e. games). 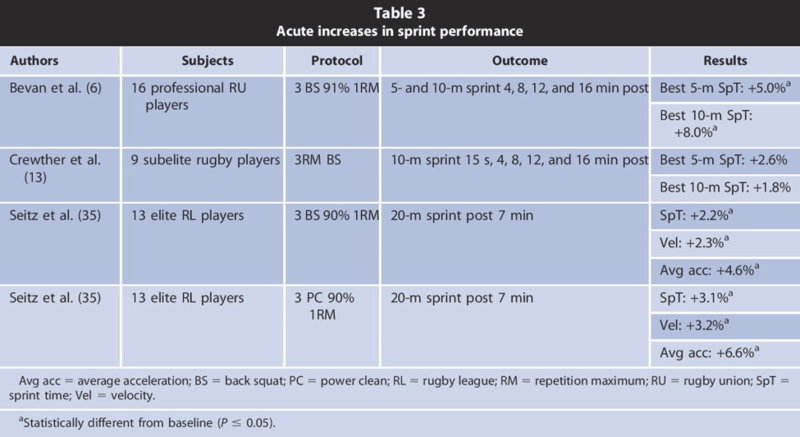 Another practical application aspect to take into account is this SPPC “rewarm-up” for rugby and rugby specific competition needs to take place relatively close to game time. A study by Mason et al attempted priming exercises one hour and forty-five minutes after adequate priming. They found that all lower body PAP had dissipated in that time frame but upper body scores significantly increased. The researches did admittedly purpose that the intensity of the lower body priming may not have been high enough to elicit PAP benefits. A very interesting side note in this particular study is the researchers found the athletes had a much higher level of self-reported preparedness for activity and just generally “felt better” later on in the day after the priming exercises. Although it is a neat talking point, this study found the improved mood didn’t transfer over to better scores on assessments (Mason, et al 2016, published ahead of print). What do you think of the possibility of adding PAP to your rugby training/match day protocol? Sounds feasible? Let us know in the comments! Chu, L., Fry, A., Weiss, L., Schilling, B., Brown, B., Smith, S. (2003) Postactivation Potentiation Response in Athletic and Recreationally Trained Individuals. Journal of Strength and Conditioning Research, 17() 671-677. Crewther, B., Kilduff, L., Christian, C., Middleton, M., Bunce, P. Guang-Zhong, Y. (2011) The Acute Potentiating Effects of Back Squat on Athlete Performance. Journal of Strength and Conditioning Research, 25(12). DeRenne, C. (2010) Effects of Postactivation Potentiation Warm-Up in Male and Female Sport Performances: A Brief Review. Strength and Conditioning Journal, 32(6). 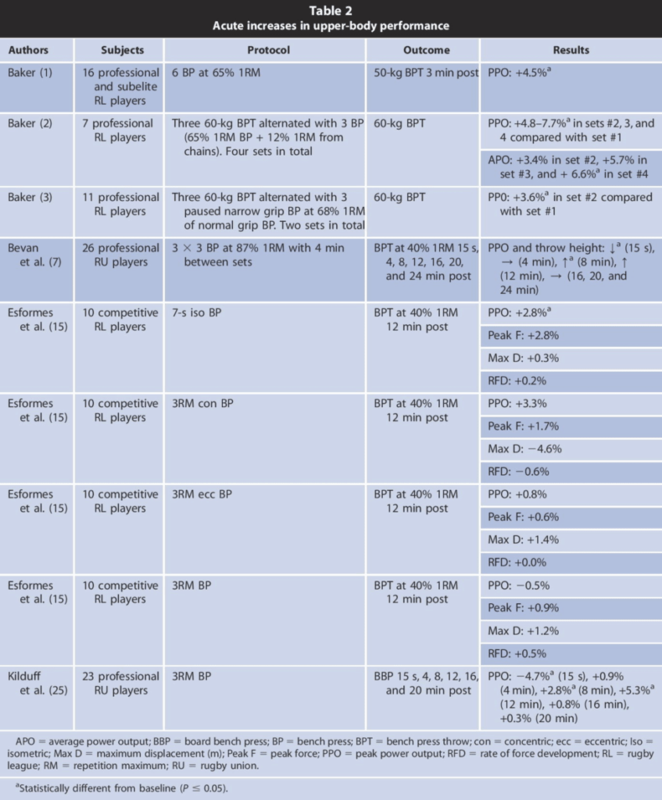 Esformes, J., Cameron, N., Bampouras, T. (2010) Postactivation Potentiation Following Different Modes of Exercise. Journal of Strength and Conditioning Research, 24(7). 1911-1916. Kilduff, L., Bevan, H., Kingsley, M., Owen, N., Bennet, M., Bruce, P., Hore A., Maw, J., Cunningham, D. (2007) Postactivation Potentiation in Professional Rugby Players: Optimal Recovery. Journal of Strength and Conditioning Research, 21() 694-700. Larent S., Haff G. (2015) Application of Methods of Inducing Postactivation Potentiation During the Preparation of Rugby Players. Strength and Conditioning Journal, 37(1). 40-49. 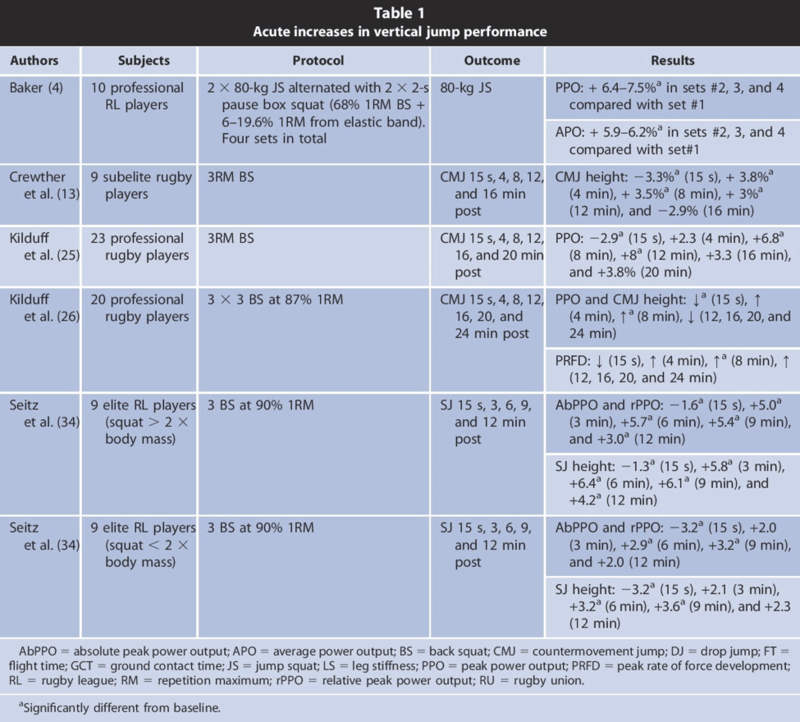 Tobin, D., Delahunt, E. (2014) The Acute Effect of a Plyometric Stimulus on Jump Performance in Professional Rugby Players. Journal of Strength and Conditioning Research, 28(2). 367-372. As a S&C coach, Mike has worked with almost 100 NCAA All Americans and 4 NCAA National Championship teams. His best lifts include a 666lb raw squat, 418lb raw bench, and 804lb raw deadlift in the 120kg class in the IPF.